The Pope is now at Holyrood House with the Queen. It was good to hear the firmly shouted commands to British soldiers who do drill quite well, and the stirring sound of the pipes. It was rather windy outside; on entering the room where the Holy Father and the Queen exchanged gifts, the Queen said that it was a little warmer in here, and asked the Pope where he would like to sit. 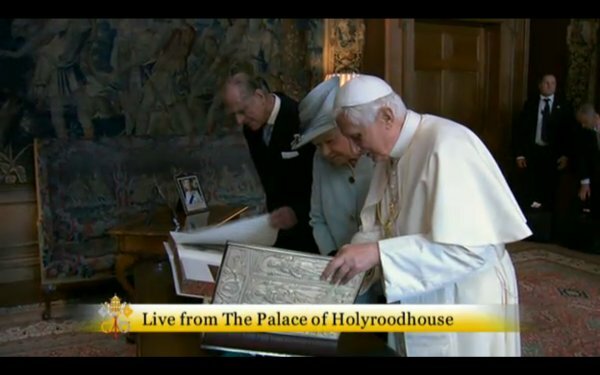 The Queen presented the Holy Father with a book of Hans Holbein prints. Included was the famous drawing of St Thomas More. The Holy Father presented the Queen with a seventh century codex. 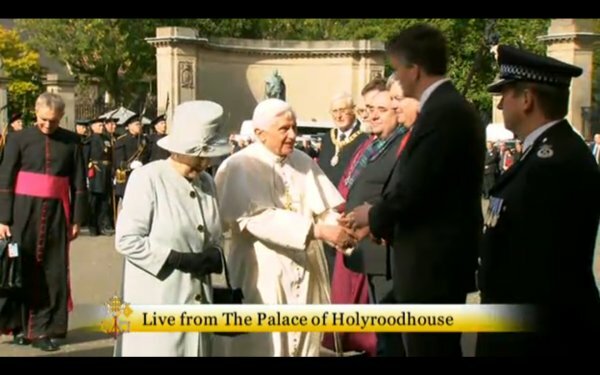 Best non-licence fee live coverage at the moment is from the official Papal Visit site. Pics above are screen grabs from there.